Can you imagine October is almost over? That means it's time to start (or continue) thinking about your holiday travels. Each year, millions of people take to the road and sky to visit relatives, friends or even just get away from the chaos of everyday life. If you want to be one of them and also want to be able to afford another trip during the next year, then I have you covered with my Holiday Savings ebook. 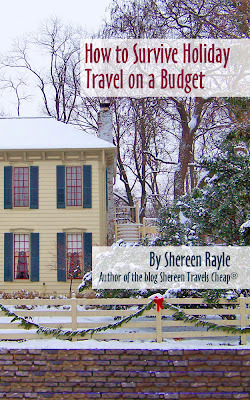 It's over 50 pages of ways to save money and your sanity over the holidays while traveling. There are tips on renting cars, getting the best prices on hotel rooms, saving on airfare, how to pack, what to pack, how to get free travel and ideas for gifts that won't have you stuffing a big suitcase and checking it to your destination. That's not even all! You probably think this ebook loaded with tips is priceless, but I'm offering it for 99 cents! As an added bonus, this book comes with cold weather packing lists that can be viewed and also downloaded to your computer for use over and over. I've aimed to arm you with all the information you'll need to make the most of your budget and also save as much as possible so you don't have to choose between that yearly trip you want to take and visiting your family over the holidays. Small Business Saturday is coming. It's your chance to help small businesses by shopping with them. Shopping small is the best way to help the economy and keep the family-owned businesses going. I think SBS should be every day, so if you need help with your holiday travel, you help keep this blog going for less than a dollar and learn some invaluable tips that will help you for years to come. You can purchase it and download it immediately on Amazon. Save hundreds for less than a dollar! How can you pass it up? What is your biggest holiday travel challenge?